New Favorite Nosh: Tomato and Cucumber Sandwich! This is barely a recipe, but it’s what I have been eating for breakfast and lunch (and sometimes in between with a cup of tea). I like it with rye toast (shown here), but it reaches its apex with white bread…. Toast and butter two slices of bread. Layer thinly-sliced cucumber (peeling is optional) and tomato – preferably fresh from the garden – on the bottom slice. Sprinkle with salt and top with the second slice. Cut in half and eat! Thanks so much for the visit…I should also be avoiding bread….but it is so delicious! I am in the process of reissuing the book myself rather than through a publisher…but can’t seem to find the time! Would it be totally wrong of me to swap the butter for cream cheese? How could cream cheese ever be even a little bit wrong? I grew up with this in Norway where we eat bread three times a day (breakfast, lunch and late supper) although we very often would put cheese as well as butter underneath the cucumber and tomato and we would usually eat it as an open face sandwich. 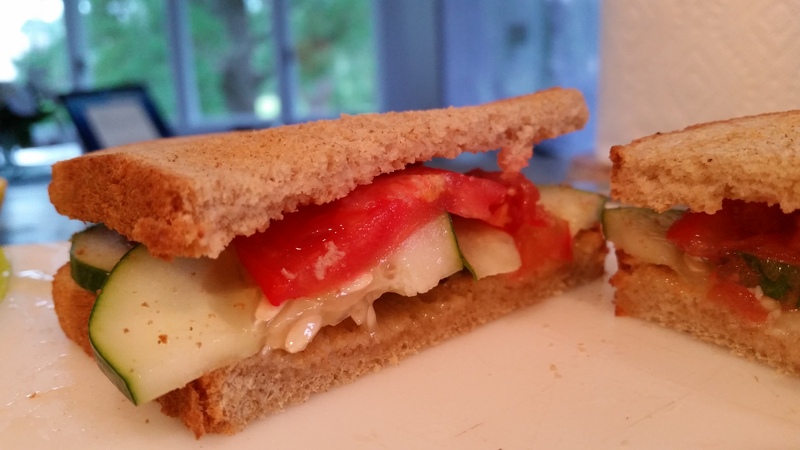 I love putting some thinly sliced brie underneath the cucumber and tomato slices. The easiest way to get thin slices of brie is to slice it cold from the fridge with a cheese slicer. If you have a triangle of brie you just follow the knife cut and slice a long thin slice along the cut. I alternate between the cut sides of the triangle. The long about inch wide ribbons with their white edges on both sides curl a bit and look great, although they will be covered up by the cucumber in this use. You can also use the cheese slicer to slice thin slices of the cucumber. If you hold the cheese slicer upside down with the tip of the cheese slicer resting on the cutting board you can kind of use it as a mandolin, just moving the cucumber for quick and even cuts. That is the method I mostly use for slicing cucumber for Scandinavian cucumber salad. Some freshly ground pepper is also nice on the cucumber or cheese. Thank you so much for this comment, Torkil! Annika (my Swedish sister-in-law for those who don’t know) also uses the cheese slice to make lovely ribbons….Must try it with brie…. BORING!?! Bread and butter is never boring (provided the bread and butter are good)…so cucumber sandwiches even less so! I think you might have hit the nail on the head – good bread and butter!